The latest version of Ads Manager performance reporting summarizes all standard performance metrics from a campaign as well as added custom breakdowns. You can use Ads Manager to rename your campaign. Naming is important when you want to organize and differentiate between multiple campaigns. The budget is the amount of money you want to spend on showing people your ads. It's also a cost control tool. It helps control your overall spend for an ad group or campaign. You have the option to convert ad group budgets to a single campaign budget after launching the campaign if you desire to spread a single campaign budget across all ad groups. Ad Group Budgets are set for each ad group when you setup the targeting tactics (rather than a single campaign budget shared by all ad groups). 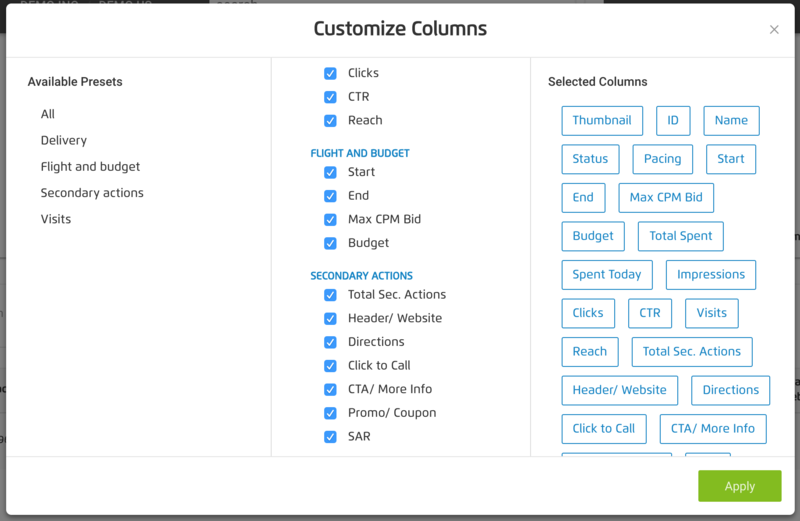 This provides you more granular control to assign budget to a specific ad group. Due to the granular control of ad group budgets, there is a risk that some ad groups may not deliver if full if the budget exceeds the available inventory. Campaign Budget is a budget you set once at the campaign level. The amount you set is applied to the lifetime of the campaign based on the campaigns start and end dates. The campaign budget will be shared across all ad groups based on available inventory. Note: in many cases a single campaign budget has the potential to accelerate pacing of ad spend by allowing the ad groups with more inventory spend a larger portion of the budget. In some rare cases, an individual ad group pacing could slow down if the flight dates of an that ad group is much shorter then the overall campaign flight dates. On the the top left of the view the trendline chart shows the daily performance of the campaign for the following metrics (Impressions, Clicks, CTR, Reach, Visits). That daily performance view can be changed to visualize the Visitation lookback window. The demographic Distribution Chart represents the gender and age breakout of delivery in terms of impression distribution. The data table at the bottom of the screen presents the detailed reporting data of all performance metrics. That data can be viewed at the campaign, placement, and creative levels by using the level selection dropdown. The navigation bar with the selection dropdowns that controls both chart and table views are now at the top. Time of Day: See what time your ads are having the highest impact. Day of Week: Understand which days your target audience is most likely to visit your store. 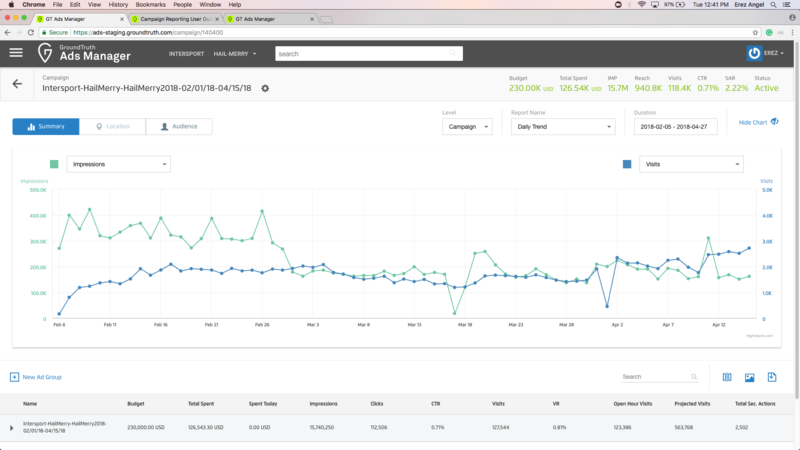 Export daily spend and campaign metrics: Interpret day-by-day campaign results. Additional Secondary Actions reporting via Column Picker: Clicks to header/ website, directions, click to call, CTA/ more info, and promo/ coupon. to be viewed. Any time a breakdown is selected that data point gets added to the table and the data can be analyzed by that additional data point. At any point, the data on the table can be exported to an excel document by clicking on the download icon on the right side of the table’s label bar. The Creatives preview for a specific placement or the whole campaign can be previewed by clicking on the creative preview icon also located on the right side of the table’s label bar.